Most American car buyers are in for a little surprise in the next few years, the V6 engines they have become accustomed to for the last three decades are soon to be a thing of the past. Soon to be replaced by 4-cylinder motors. You may have heard about the Corporate Average Fuel Economy (CAFE) standards in the past but you are soon to feel its far reaching affect. CAFE which first mandated that all an automaker’s cars sold in the U.S. had to meet a fleet average fuel economy standard of 18 mpg in 1978 has had more of impact on the cars we drive then most realize. Back when the CAFE bill was passed in 1975, most cars were large and had a V8. A small car back in 1975 such as the Chevrolet Nova is around the same size of a full-size 2012 Chrysler 300. When the CAFE bill became law back in 1975, U.S. automakers went on a feverish pace to shrink the size of all its cars and the engines that powered them. By 1985 the CAFE standard was up to 27.5 mpg and the average car was much smaller. For instance a 1975 Oldsmobile Ninety-Eight which was a full-size car that had a length of 232.2 inches and width of 79.8 inches, a standard (7.4 liter) 455 CID V8, and was rear-wheel drive, by 1985 it had shrunk to a length of 196.4 inches and a width of 72.4 inches. Adding to that the 1985 Ninety-Eight could only be equipped with a 3.8 liter (231 CID) V6 and was front-wheel drive. The Ninety-Eight’s wheelbase had also shrunk from 1975’s 127 inches to only 110 inches in 1985, but the real shocker was the massive price increase for a much smaller car, a 1975 Ninety-Eight sedan had a base price of $6,091 while the 1985 had a base price of $14,665. Inflation was partly to blame but development costs were a large part of the increase. Oldsmobile and GM spent in order to shrink the car and countless hours spent ensuring the 1985 Ninety-Eight would comply with the ever changing CAFE standards. There was a lot of inflation of the U.S. dollar from 1965 to 1975, yet the base price of a Ninety-Eight sedan was only 35% more than the base price of a 1965 Ninety-Eight sedan which had a base price of $4,001. In the ten years from 1965 to 1975 the cost of a Ninety-Eight had only risen 35% however the car was bigger, more luxurious, and offered more standard features than the 1965. However in the ten year period between 1975 and 1985 a Ninety-Eight had gone up by 240%. The 1985 may have been more advanced however most of the advancements were items such as front-wheel drive, fuel injection, and computer controls. All of which were added to the car to allow it to meet the CAFE standards, so the owner didn’t get any benefits except for improved gas mileage. One area where the 1985 Ninety-Eight was inferior was it was not as safe in a accident as the 1975. The seat belts in the 1985 were better however at a curb weight of only 3,297 it weighed a lot less than the 4,743-lb Ninety-Eight sedan. And any police officer will tell you in an accident occupants in a car with larger mass and more weight fare far better than those in a smaller car with less mass and lighter weight. Makes you wonder how many highway fatalities can be attributed to CAFE. The shrinking of cars also necessitated the continual increase in safety standards which is the main reason why cars have put on so much weight in the last three decades. As in the example used previously a 2012 Chrysler 300 is about the same size as a 1975 Chevy Nova, however the Chrysler 300 base curb weight is 3,999 lbs versus the Nova’s base curb weight of 3,276 lbs. The Chrysler 300 has a lighter engine and uses many more plastic and lightweight parts when compared to the Nova. However the Nova doesn’t have anti-lock brakes, an onboard computer, airbags, and other safety accessories now mandated by law which add weight to a car. This has also hurt CAFE compliance since the heavier a car is, the more fuel inefficient the car will be. Another factor that’s overlooked concerning CAFE, is how when it was first implemented it put U.S. automakers at a tremendous disadvantage when compared to their Japanese automaker competitors. All the Japanese automakers including Honda and Toyota made small fuel efficient cars so they did not have to worry about C.A.F.E. compliance during the late-1970s and the 1980s hence they didn’t have to spend the millions of dollars U.S. automakers did on compliance during those early years. By the 1990s when Japanese automakers began to increase the size of their cars and offer larger and more powerful motors then they began to start to spend some serious money in innovation to comply with CAFE. Some of the bad products that U.S. automakers released that tarnished their names was done in the late 1970s and early 1980s in order to comply with CAFE. Examples of these are the Oldsmobile diesel 5.7 liter V8 and the Cadillac V8-6-4 (with cylinder deactivation) – both of which were implemented to make some of their cars CAFE compliant. The cost of not being compliant was a gas guzzler tax which during that era of bad economic times would have killed much needed car sales. Even as small as cars had become by the mid-1980s they would have probably shrunk down another size or two had it not been for a rollback in the CAFE standard starting in 1986 – it was dropped down to 26 mpg. It soon crept back up to 27.5 for 1990 where it remained unchanged until 2010. For 2011 it was bumped up to 30.2 mpg and by 2016 it will jump to 35.5 mpg. And if you think that’s a climb just wait, the Obama administration has recently announced it’s planning on making 56 mpg the CAFE figure for 2025. Which if implemented will most surely ensure that the current underpowered 4-cylinder powered compact-sized Prius is what our "large cars" will be like in 2025. With this in mind you can expect cars to shrink in size. Also the V6 which replaced the V8 on most mid-sized and large cars during the first wave of the CAFE standards, will soon find itself replaced by 4-cylinder motors. And just like today where V8s are only offered mostly in SUVs and expensive cars (luxury cars and sports cars), V6 motors will soon become as rare as V8s in the future where they will be reserved for more expensive cars which will be out of reach of the average buyer. And most current V8 offerings which are found in more expensive cars may also disappear and be replaced by V6 or 4-cylinder motors. If that’s not enough bad news for the average car buyer, expect car prices to skyrocket. Americans for Tax Reform is expecting the proposed 2025 standards will increase the cost of a new car by $5,720 to $6,714 – the Environmental Protection Agency (EPA) predicts the cost increase to be $2,100 to $2,500. 2025 may seem far away with the 2012 model year cars just now arriving at new car dealers, however changes can already be seen by automakers to comply with the 2016 CAFE figure of 35.5 mpg. BMW is replacing in its 2012 528 and 328 series the popular 6-cylinder motor with a new turbo 2.0 liter 4-cylinder motor. Cadillac will be releasing a new ATS model which will only use GM’s turbo 2.0 liter 4-cylinder motor (if this release had been a couple of years ago a V6 would have been standard on the ATS). Motor Trend is reporting that this GM turbo 2.0 liter motor will soon replace the 3.6 liter V6 on Chevrolet’s mid-size Malibu. GM Inside News first reporting on this new engine and the Autoblog mentioned this news "only stokes the rumors indicating that GM is walking away from V6 drivetrain options in its mid-size offerings altogether." 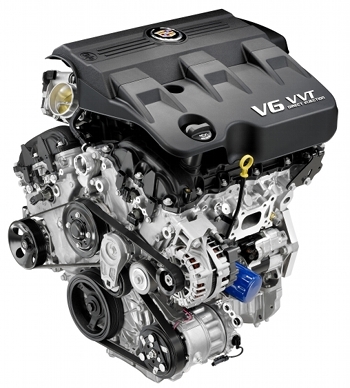 With a CAFE mandate of 35.5 mpg for 2016, you can expect this to be true, there’s no other way GM can meet this standard but to replace the V6 with a 4-cylinder motor in most of its cars including its mid-size lineup. Also worth noting the original wave of CAFE standards forced many Americans out of their large cars – including large station wagons which were a favorite among many American families. Even though CAFE standards were enacted for small trucks which later on became know as SUVs, many SUVs were larger in size and had more cargo space than most cars available due to the car shrinkage caused by CAFE. This is one of the factors why SUVs skyrocketed in popularity. Unfortunately buyers this time won’t have the luxury to jump to SUVs while cars shrink due to the future increases in the CAFE standard. The CAFE standard for trucks will also be increasing, so future SUVs will more than likely shrink in size just like cars. Now there are some who point to electric cars as the answer. Despite all the hype the electric car is not at this time going to be the way of the future. As reported by The Daily Caller, a 115-year-old electric car gets the same 40 miles to a charge as the new 2012 Chevrolet Volt. All the other electric cars on the market are in the same boat they don’t get enough miles in a single charge. Until an electric car can reach 500 miles before requiring a recharge, the electric car will be insignificant and nothing more than an expensive toy. Using accessory items like a car radio, air-conditioning, heating, lights, turning signals, etc. will shorten the driving distance an electric car can go between charges. Not to mention what about the unexpected traffic jams encountered during daily driving. How would you like to be stuck in a 5 mile backup that has your car running for well over an hour but not moving more than a crawl due to an accident with 20 miles left on the charge? You can expect to be calling the tow truck before you pass through the traffic obstacle due to the battery running out of charge. And this doesn’t even mention how the EPA is planning on shutting down U.S. coal burning power plants without replacing them with new power plants. The end result will be higher energy costs and a big strain on the U.S. power grid. Adding millions of electric cars draining power from the U.S. power grid as power plants are being shutdown and not replaced, will bring the entire power grid to its knees. CAFE, which was originally made law a few years after the 1973 oil crises, has forever changed the auto industry. It once was automakers responding to the market demands of the customer that determined what cars automakers offered. This has changed, as the CAFE standards increase it’s now the government that determines what type of car is available for you to buy. Something is seriously wrong with this picture. CAFE should be abolished just like the infamous "Cash for Clunkers" bill which was also a big waste of the taxpayers money. We live in an era of high gas prices which in themselves would still force automakers to make fuel efficient cars since the market (most customers) would demand it, so CAFE isn’t needed. This would also ensure that those who want or need a less fuel efficient bigger car, would be able to purchase such a car. As previously mentioned CAFE is going to determine what you can buy in the future and most buyers are not going to like it. Unfortunately most buyers won’t realize this until the current crop of affordable mid-size to large V6 powered cars (the most popular and best selling cars currently) are gone. By then it will be too late.